These charts by Branko Milanovic deserve looking at again and again. A few years ago Adrian Wood told my entire economics class to print off the Angus Maddison long-run world GDP chart and stick it on our walls so we’d look at it every day. I’d suggest adding the Milanovic chart alongside it. 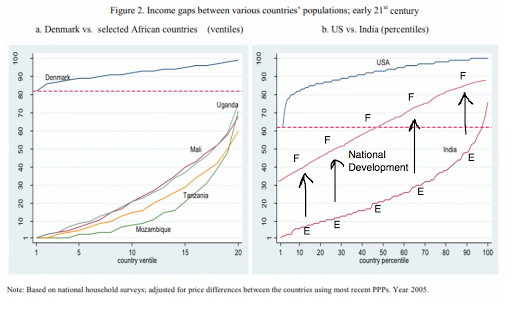 I was struck earlier today (whilst listening to the latest Development Drums) how these charts could be used to illustrate the comparison between anti-poverty programs and National development that Lant talks about. 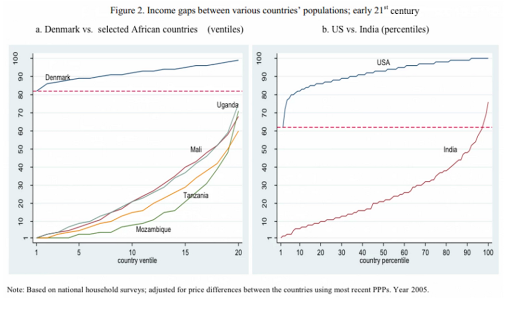 Projects to increase an individual’s income in developing countries can help people get a better livelihood amongst those available in that country, but they probably aren’t going to change the overall set of opportunities facing people living in a country. If you want to earn yourself rich, you need to sell stuff to rich people - that means exporting goods or services to rich countries (trade), moving to a rich country to sell your labour (migration), or encouraging rich people to come visit your country (tourism). 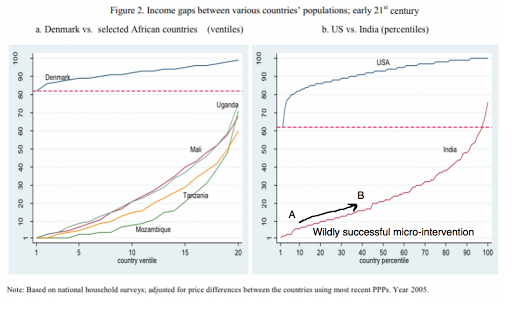 Graphically, the most successful ever anti-poverty program might at best move a bunch of people from point A to point B. 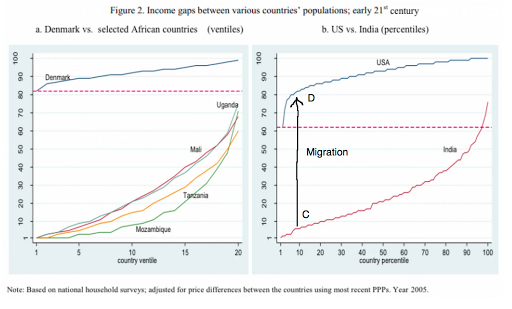 By comparison, migrating lets someone move from point C to point D.
And for something truly transformative, national development, probably based on exports, allows the whole country to shift up from E to F.
Anti-poverty programs can’t solve poverty.